Updated: 9th September 2017 - Minor text updates. This first set is an absolute beauty and was one of the most expensive things I've ever bought. 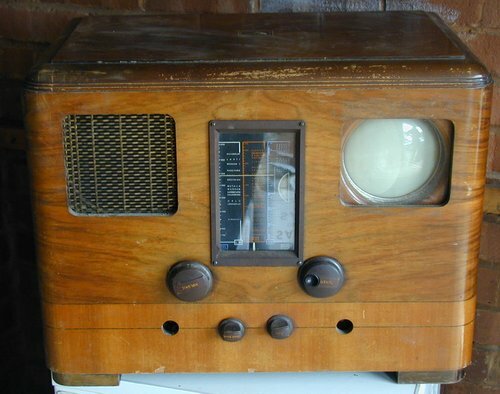 It's a 1930 Baird "Televisor" - a very early mechanical television. 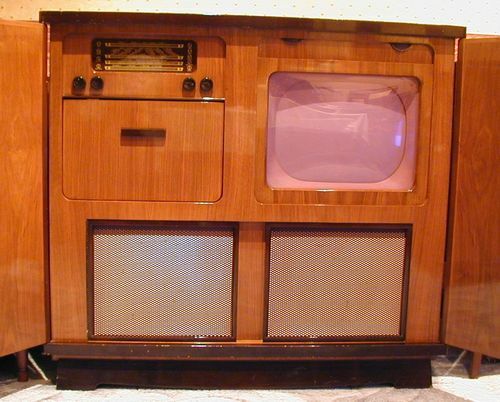 I bought it from a very nice couple in the South East of England who inherited the shop where the TV was first sold. To view the "picture" you have to squint through the little aperture on the right. What you see through the little cubby-hole is a red neon lamp shining through a spinning disc with a set of 30 holes laid out in a spiral (known as a "Nipkow Disc") and then it is this that is magnified by a fairly powerful lens to make the picture. 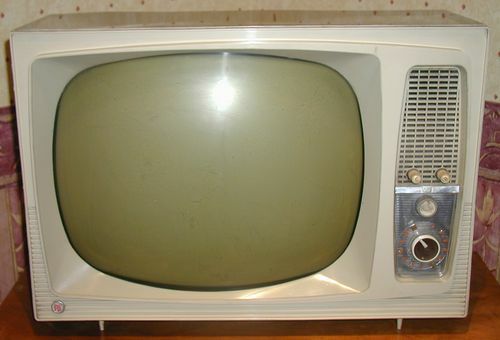 The disc is spun at a constant rate (set roughly by the knob on the left of the set and synchronised to the signal by means of a magnetic "synchroniser" coil) and phase (set by the control in the middle of the set to frame the picture correctly). The brightness of the neon is then varied in synchronisation with the disc to create a fairly crude black-and-red 30-line picture. I'll put some more information up about the set shortly. 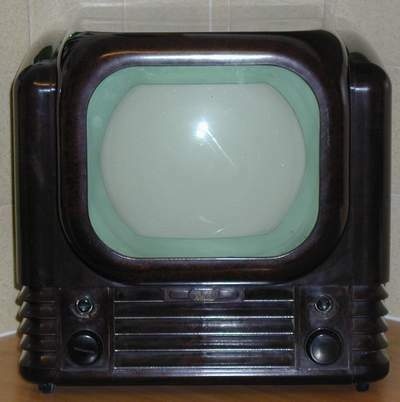 This is a 1950 Bush model TV22. 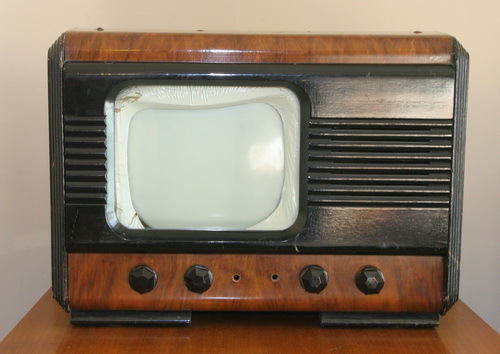 The TV22 is a development of the earler Bush model TV12 and TV12A (see Gallery Page 1). I have yet to start any restoration on this set, but I will take another picture of it once it's all sorted out. 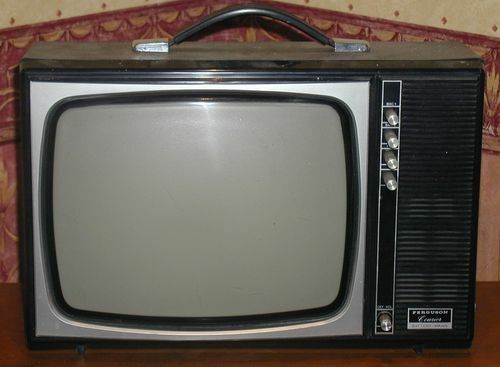 This Ekco TS88 is the first 405-line-only TV I ever bought. 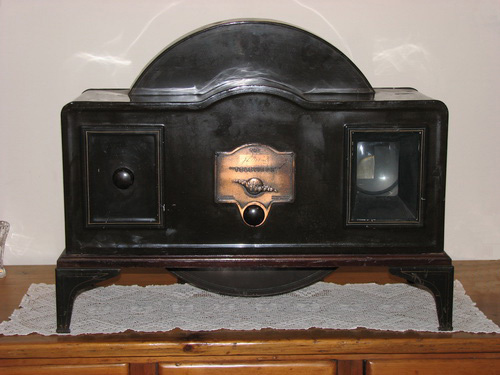 It came from a shop called Kilve Marchant Antiques in Woodbury Salterton in about 1995-ish and cost me 45 pounds. The end had come off the CRM92A tube but the vacuum wasn't impaired and the wires were still sticking out, so my mate Alec Jefford from Exmouth and I managed to work out which wire was which and resolder them. 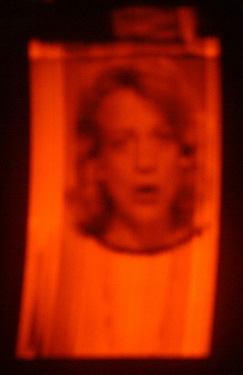 The base was then re-glued and taped onto the tube and all worked pretty well. The tube's emission wasn't all that good however and, although the set produced an excellent picture, it was a bit dull and really needed to be viewed in a darkened room. The tube has since been replaced with a much nicer example of the same type - in fact it's the nicest CRM92A I think I've ever seen and the picture is now lovely and bright. This set is a Ferguson 3816 and uses the fully transistorised Thorn 1590 chassis. 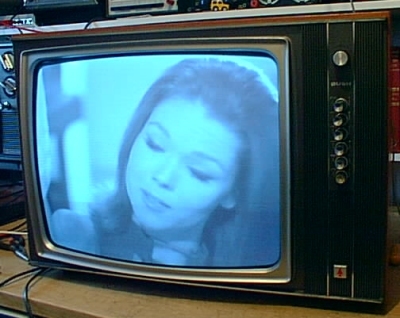 The set looks very similar to the hybrid (valves and transistors) model 3805, which can be found on Gallery Page 1. This set, unlike the 3805, can be run from a car battery, whereas its older brother is a mains-only set. This lovely little GEC BT2147 was a set I purchased from a nice couple at a radio rally in Golborne in 2012. The set needed a fair amount of work to get it going because it had previously had a lot of slightly-messy repairs to it, but also because there were several problems with "mechanical" things like valve-holders and pots etc. Anyway, it's working well now and produces a really nice picture. 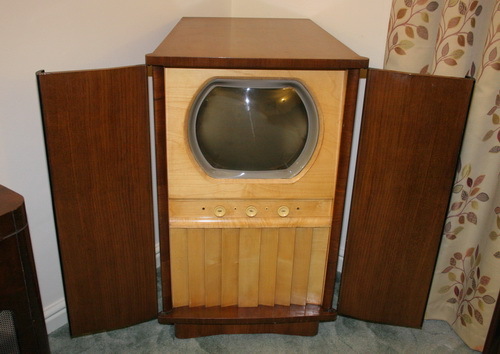 Next is a very large and heavy Invicta T118 16" Television / Wireless / Record Player. It came from an excellent chap called John from London. I went up with Andy Beer to look at it originally and we decided that it would need a much larger car than I had to take the huge beast away. Some weeks later I came up to London with a Transit van to pick the thing up (Much to John's relief) and we managed to cart it down the stairs and into the van without too much bother. 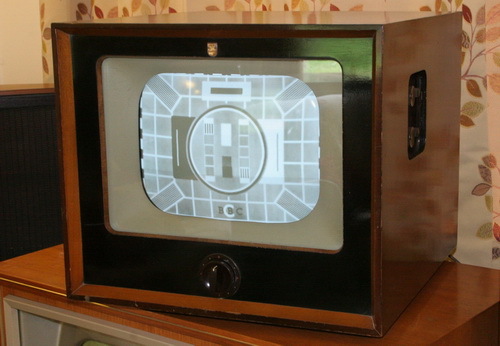 The TV chassis is very similar to the Pye FV2 and utilises the same 16 inch metal-cone tube. Save for a few valves, it appears to be complete, but it does need some electrical restoration before it is really useable. Many thanks John - it's a fantastic set. 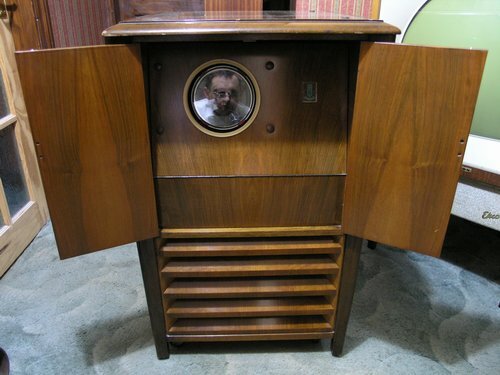 This set is a 1954 Philips 1446U . This was one of the sets near the bottom of my long "To Do" list but my pal Tony came round one day and spotted it and insisted it be the next job on my list. Out it came and after a good weekend's worth of prodding, fiddling and twiddling (which can be read about here) the set was all sorted out and the picture below was duly taken. 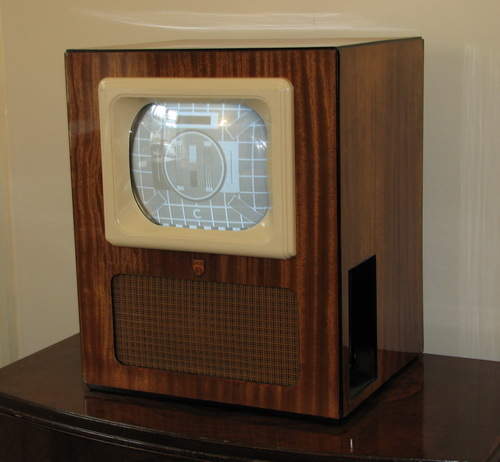 This next set is a 1961 Pye V220 and came from an excellent chap from Stoke-on-Trent. Apparently it worked before it went into storage, but I haven't been brave enough to fire it up yet. 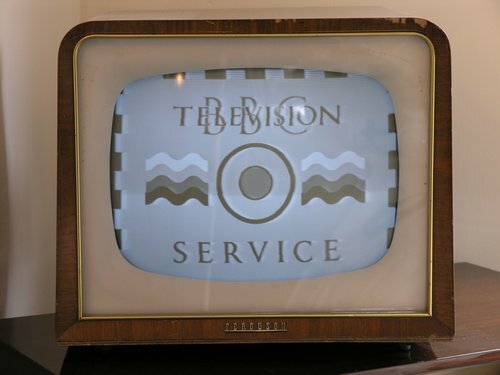 This set is a 1953 White Ibbotson 2015 single channel projection set which was rescued from Exeter recycling centre. Somebody has pinched all the valves out of it, but apart from that, it looks fairly sound electrically. I haven't done anything about fixing it yet. In fact I haven't even replaced the missing valves. I have recently been contacted by relatives of Mr Ibbotson, and was very kindly supplied some operating instructions for this set. And here's another White Ibbotson set, but this one is slightly different to the previous two (see Gallery Page 1 for the White Ibbotson 2418). This set is a front (or forward) projection set. 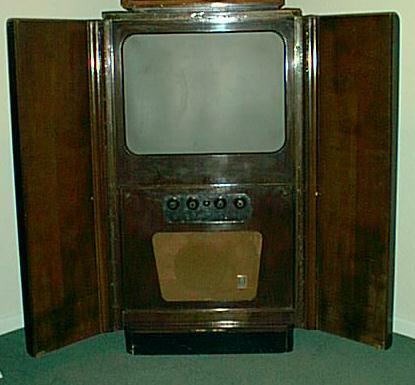 To watch the old monster, you would wheel out the unit 3 or 4 feet from a purpose built screen and the picture would be projected forward from the lens concealed behind the 2 doors on the front. As with almost every other White Ibbotson set I've ever seen, this has no model number stamped on it although I happen to know (from my pal Jon) that it is a model 4836F. The number indicates that the picture produced is a whopping 48 inches by 36 inches. 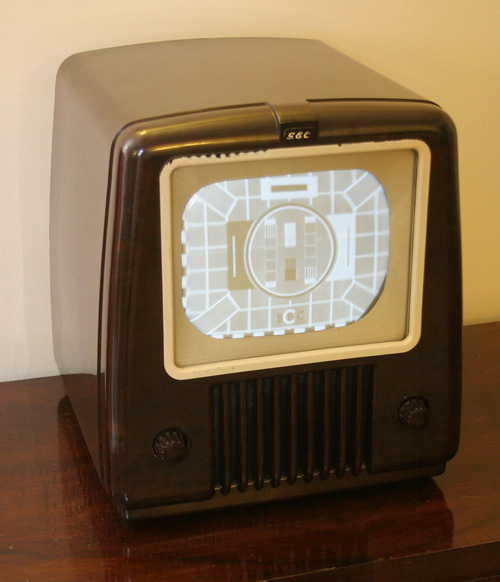 Does anyone have a White Ibbotson standalone screen they might be able to sell me?